I have a line on a pretty much endless supply of thick reinforced vinyl advertising banners with eyelet corners. Used as all-weather banners at a cinema. Printed one side, usually solid colour other side. 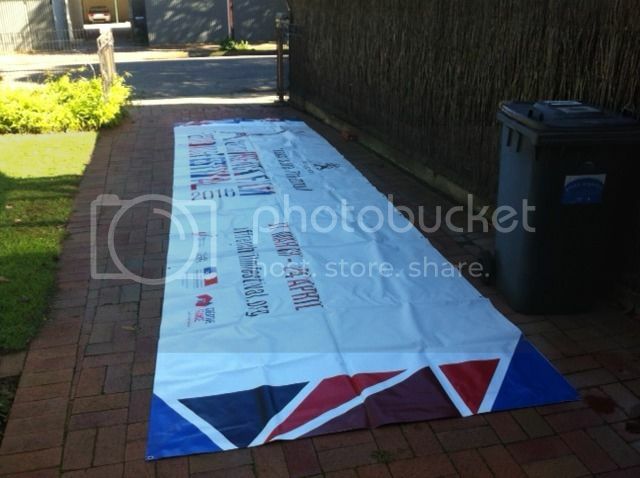 Approx 1m x 5m, some bigger/ smaller. Would be great for bike pits or have a couple sewn/sealed/ gaffed together. Hey B R , just a thought, might pay to make sure the printed side wont leave any marks on the salt after a week if placed that side down. G'Day BoyRacer, so what's the deal? Are you looking to sell these or are you donating them for the common good? We can always use more tarps! I have stockpiled about 20 I will donate to club. A mate works there as handyman. I helped him do a job a while back and tripped over them in store room.They have to get rid of some of them when pile gets to 1 metre high. He is happy if I take more as he doesn't have to deal with 'em. That's great! I have no idea what a king brown is, I'm assuming it's South Australian speak for some sort of beer? We can probably get someone to pick them up if it gets to be a hassle. DLRA wrote: That's great! I have no idea what a king brown is, I'm assuming it's South Australian speak for some sort of beer? Where do you want them? At the lake or melbs? I can hold until someone comes by...working bee? I'm inner suburbs Adelaide (Goodwood). I can ask Michael Brixton or Peter Noy to arrange pick up. Working Bee this year will probably be in October. Let me see what I can arrange. Here is one.... 6m x 1.5m approx. I might try and gernie one to see if the print comes off. If WB is in early October (SA school hols) i can possibly help too! I know other people have used them with no problems. That one isn't too bad, lots of white. We will just have to make sure they get laid face up. Being white they may be better if the print is left on them. Any one want to take a pile of tarps to the lake?